After two hours, we were finally in Ko Phangan! A famous tropical thai island for backpackers, great beaches, waterfalls and of course, the Full Moon Party held every month. The schedule of the event is changeable, so it must be checked on their official website. The prices always go up and hostel booking should be done at least few weeks before. We stayed at the Thai Dee Garden an overpriced bungalow for its conditions, located in Haad Rin – a small village where the party takes place. After some days we found much better for half of what we paid, Bird Bungalow. From our traveling experience in Thailand, is always better to search for a place to stay “in loquo” than to book it online. This way you avoid any surprises (a lot of pictures don’t match) and even sometimes you can get a better price staying more than one night. On the party day, we were quite anxious and curious about how was going to be. Tons of people from all around the world, most of them dressed and painted with fluorescent colors, Thai fire performers, several stages, lots of food and drinks, could only be hilarious and fun. Actually, after all the crazy stories we heard and with all the scenery we were a bit let down. The stages just played the same EDM remixes mainstream songs over and over again, the side acts were poor compared to the ones we saw in Ko Phi Phi and in the end was tons of trash and wasted people passed out on the beach. We would say, Ko Phangan is worth it for what the island have to offer and not for its known Full Moon Party. During our stay we tried to explore the island the most as we could, cause after all, we were wrong. The monsoon didn’t come to an end at all! It rained cats and dogs every single day and only once in a while the sun went out from the clouds. We bought two yellow plastic covers and went in direction of Tong Sala pier where was a food market very near. From there we kept moving to Salad and Hidden beach situated more on the north. It was a good ride, beautiful landscapes and everything looked more tidy and organized than in the south. On our return, a friend of ours pulled over and gave a lift to a British guy heading our way. Five minutes later, the heavy rain came and we couldn’t continue, it was getting dangerous to drive on slippery roads. Sheltered, the guy drew a harmonica from his pocket and started to play a blues tune. That moment helped us to become in a better mood and to move forward. It was a hell of a ride. When ever the sun was not shy, we would always go to our favorite spot, Leela Beach. White sand, crystal water and just a few minutes walk from Haad Rin center, perfect to chill, snorkel or just watch local fishermen’s! We started to call it our little paradise, where we had several moments of yūgen. We arranged a taxi pick up from Had Riin to Tong Sala peer and as soon as we arrived, the place was completely packed with travelers from all around the world. 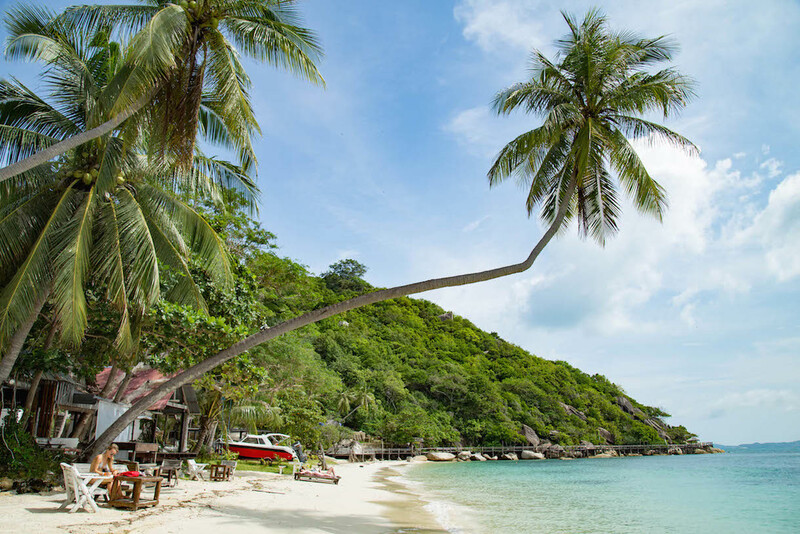 Next destination – Ko Tao.